I appreciate that peaceful and beautiful image to accompany such truth-filled words--words that always challenge me to assess whether or not I'm living them . . . Thanks so much, Michele. That was probably the largest Monarch I had ever seen. Julie, this is my favorite verse. Truly. Thank you for blessing me this morning! What a lovely verse as your favorite! What more could we want than the Lord? 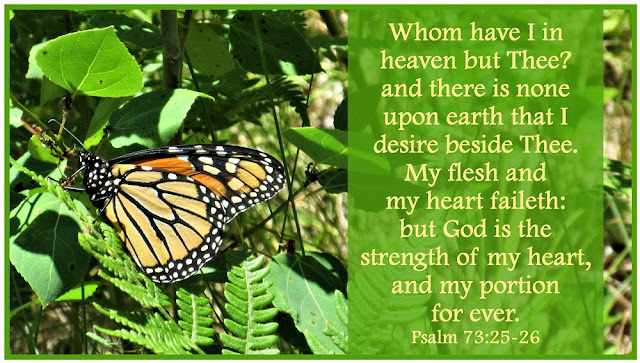 Our mortal flesh is weak, but God is our strength and our inheritance is heaven! That knowledge should surely bless our days! Thank you, Pat. I love the new lighthouse header on your blog! That verse is like healing balm to my heart! What a beautiful monarch picture! And the verse that accompanies it is wonderful! Thank you for your kind comment. This butterfly will make another appearance next Sunday!